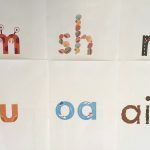 Last week I went to an information session about the Davis Dyslexia method, held in a local library by someone who has recently set up a centre offering this method in my area. 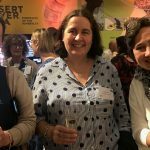 I came away from it feeling very sad that mainstream schools and professionals are not always meeting the needs of slow progress readers, using methods for which there is scientific evidence. Understandably, this leaves desperate parents seeking out and coughing up for "alternative" treatments like the Davis Dyslexia method. The person running the session seemed nice, and clearly she fervently believes in what she is doing, but what she said simply made no sense to me. Her theory about dyslexia was mostly about picture thinking, orientation/disorientation, eye tracking etc. 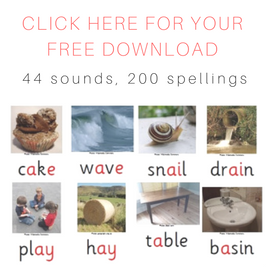 There was nothing about phonemic awareness, letter/spelling knowledge, rapid automatic naming, auditory memory or other areas that we know tend to be core deficits in slow-progress readers. 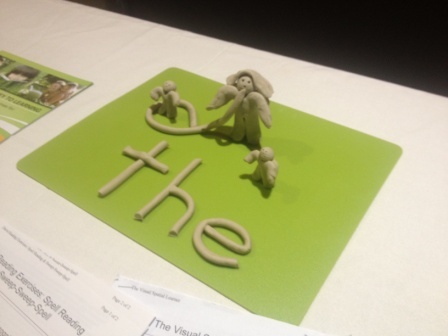 Her methods seem to me unlikely to help these learners much either – making clay models to represent grammar words like "the" (as per the above picture), throwing a koosh ball, crossing the midline, eye tracking exercises, "exercises designed to take away layers of emotion associated with some letters of the alphabet" and so on. 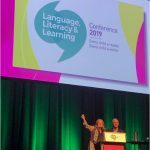 Linguistics pretty much didn't get a look-in, in fact the presenter said, "this method is the only non-phonics method in Australia". Well, thank goodness for that. The session presenter seemed not to understand my question, "Why would parents choose your method which doesn't have any proper scientific evidence over methods which do?" It's not really possible to have a discussion about what constitutes proper scientific research in such a forum – with controls for maturation, practice effects, regression to the mean and placebo effects, use of correct statistics, replication etc. But this matters. A lot of poor-quality research gets published. As often happens, the talk started off with a lot of pictures of brains, reminding me of Professor Dorothy Bishop's wonderful Emanuel Miller Lecture in which she explains that pictures of brains lead to suspension of critical faculties. If it looks like high-tech neuroscience, we all tend to think it must be true. Of course pictures of brains tell us little or nothing about how to teach literacy skills well. The session's presenter told us that dyslexia is a difference not a difficulty, that people with dyslexia are talented 3D picture thinkers, are "actually overly intelligent in many cases", and have enhanced performance in spatial awareness, reading people, strategic planning, mechanical arts, drama and role play, music and dancing, inventing, designing, manual skills, art, building, athletics, piloting vehicles, engineering, storytelling and architecture. Of course it's very appealing to parents and struggling learners to hear that their difficulties are actually a sign of brilliance in other areas. The talk also included lots of anecdotes about people who have successfully used this method, with life-changing results. These came from a couple of audience members as well as the presenter, so as a polite dissenter I was outnumbered. Anyway those attending the session had been let down by the mainstream system, so why would they care what the mainstream system thinks? Everyone who works in this field can tell you anecdotes of successful intervention. A teacher, an aide and a parent all commented to me today at school that the children I've been working with are making good progress on their literacy. So what? The plural of anecdote is not evidence, and if a method is not based on sound evidence and/or evidence-based theoretical frameworks, AND (not or) you can see children are making progress, children shouldn't be using it, and parents shouldn't be paying for it. Unfortunately, we all find it easier to understand narrative and sales pitches than data and evidence. Scientists and clinicians don't always know how to do the narrative/sales pitch thing, even if they wanted to and could find a way that didn't compromise their professional integrity. But seeing parents at the session buying into the sales pitch for the Davis dyslexia method made me think that perhaps it's time to try. 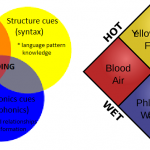 This entry was posted in literacy problems, teaching strategies on August 1, 2013 by alison. My impression from reading the Davis book is that the author makes a claim that some Dyslexics, specifically those suffering from Autism, struggle with literacy not because of a failure of the phonemic cognitive systems but because of heightened 'noise' due to an overwhelming visual style of thinking. It's hard to see how Davis can go about getting his evidence, he has a theory of Autism that is as new as his theory of the dyslexia comorbid with it, and he would need enormous resources in order to find dyslexics with autism and then controls and then devise some kind of test that could even begin to stake out his underlying claim before he even got to the point where he could then test whether his method was an effective intervention. It's not like he is a huge research university, he's some guy who tries to teach kids to read the way he learned how to read because he believes it worked for him. If there is a second 'type' of dyslexia, one caused by the reasons alluded to by the Davis people, it would be hard to find, even if you were a big university with a pack of grad students to put on it, (you could look for dyslexics who performed well on Embedded Figures, define them as your cohort and have dyslexics who performed only averagely on Embedded Figures as your control I guess..) but who is likely to go looking? 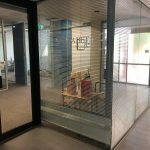 It seems clear to me that there is a hostility to the idea that there may be a second 'type' of dyslexia, so I guess we will have to wait until the anecdotes add up to something so suggestive that researchers take it seriously and investigate, and then you might end up with evidence after all. ps Elliot and I are very happy with Spelfabet and your great work with him so far, we won't defect to the Davis lot just yet 🙂 although I do think his ideas are more interesting than a lot of mainstream academics give credit for. I was one of those parents that, in a desperate attempt to get some help, jumped on the David method. I’ve learned a lot since then, thanks to great articles here and other places. It was a waste of money and my son’s valuable time/energy/motivation. They presented all the things you mentioned Alison, and also that phonics just don’t work for some people. That made sense to me at the time, because my son had been as school for 2 years and they “worked on their letters and sounds”. So I thought, if he still doesn’t get it then maybe they are right and phonics don’t work for some. Little did I know or understand how poorly this is done in most schools. 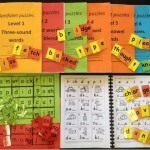 With synthetic phonics and revision he is making great progress. Thanks for sharing your knowledge Alison.